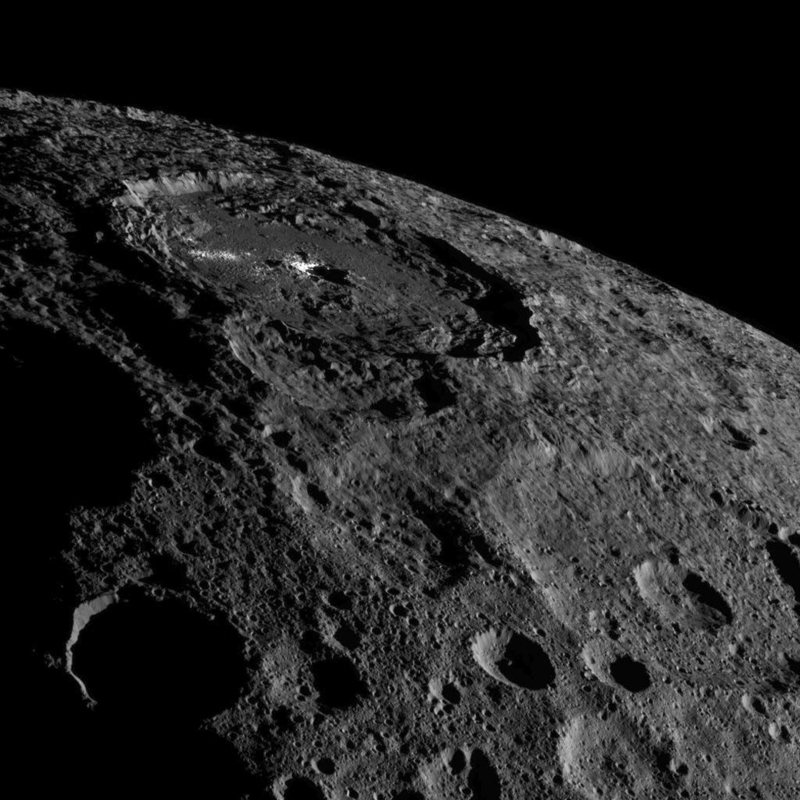 "Dawn has revealed that Ceres is a diverse world that clearly had geological activity in its recent past,” said Chris Russell, principal investigator of the Dawn mission, based at the University of California, Los Angeles. A surprising finding emerged in the paper led by Russell: Dawn may have detected a weak, temporary atmosphere. Dawn's gamma ray and neutron (GRaND) detector observed evidence that Ceres had accelerated electrons from the solar wind to very high energies over a period of about six days. In theory, the interaction between the solar wind's energetic particles and atmospheric molecules could explain the GRaND observations. A temporary atmosphere would be consistent with the water vapor the Herschel Space Observatory detected at Ceres in 2012-2013. The electrons that GRaND detected could have been produced by the solar wind hitting the water molecules that Herschel observed, but scientists are also looking into alternative explanations. "We're very excited to follow up on this and the other discoveries about this fascinating world," Russell said. The small, bright crater Oxo (6 miles, 10 kilometers wide) on Ceres is seen in this perspective view. The elevation has been exaggerated by a factor of two. The view was made using enhanced-color images from NASA's Dawn mission. Ahuna Mons is a volcanic dome unlike any seen elsewhere in the solar system, according to a new analysis led by Ottaviano Ruesch of NASA's Goddard Space Flight Center, Greenbelt, Maryland, and the Universities Space Research Association. Ruesch and colleagues studied formation models of volcanic domes, 3-D terrain maps and images from Dawn, as well as analogous geological features elsewhere in our solar system. This led to the conclusion that the lonely mountain is likely volcanic in nature. Specifically, it would be a cryovolcano -- a volcano that erupts a liquid made of volatiles such as water, instead of silicates. "This is the only known example of a cryovolcano that potentially formed from a salty mud mix, and that formed in the geologically recent past," Ruesch said. infrared mapping spectrometer (VIR) to detect probable water ice at Oxo Crater, a small, bright, sloped depression at mid-latitudes on Ceres. 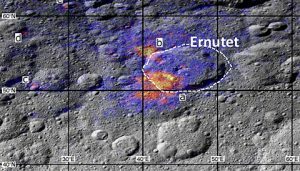 Exposed water-ice is rare on Ceres, but the low density of Ceres, the impact-generated flows and the very existence of Ahuna Mons suggest that Ceres' crust does contain a significant component of water-ice. This is consistent with a study of Ceres' diverse geological features led by Harald Hiesinger of the Westfälische Wilhelms-Universität, Münster, Germany. The diversity of geological features on Ceres is further explored in a study led by Debra Buczkowski of the Johns Hopkins Applied Physics Laboratory, Laurel, Maryland. Impact craters are clearly the most abundant geological feature on Ceres, and their different shapes help tell the intricate story of Ceres' past. Craters that are roughly polygonal -- that is, shapes bounded by straight lines -- hint that Ceres' crust is heavily fractured. In addition, several Cerean craters have patterns of visible fractures on their floors. Some, like tiny Oxo, have terraces, while others, such as the large Urvara Crater (106 miles, 170 kilometers wide), have central peaks. There are craters with flow-like features, and craters that imprint on other craters, as well as chains of small craters. Bright areas are peppered across Ceres, with the most reflective ones in Occator Crater. 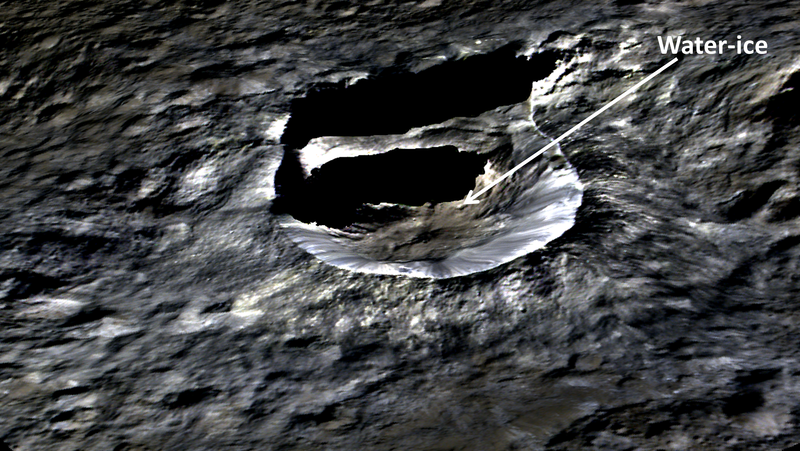 Some crater shapes could indicate water-ice in the subsurface. The dwarf planet's various crater forms are consistent with an outer shell for Ceres that is not purely ice or rock, but rather a mixture of both -- a conclusion reflected in other analyses. Scientists also calculated the ratio of various craters' depths to diameters, and found that some amount of crater relaxation must have occurred. Additionally, there are more craters in the northern hemisphere of Ceres than the south, where the large Urvara and Yalode craters are the dominant features. "The uneven distribution of craters indicates that the crust is not uniform, and that Ceres has gone through a complex geological evolution," Hiesinger said. What are the rocky materials in Ceres' crust? A study led by Eleonora Ammannito of the University of California, Los Angeles, finds that clay-forming minerals called phyllosilicates are all over Ceres. These phyllosilicates are rich in magnesium and also have some ammonium embedded in their crystalline structure. 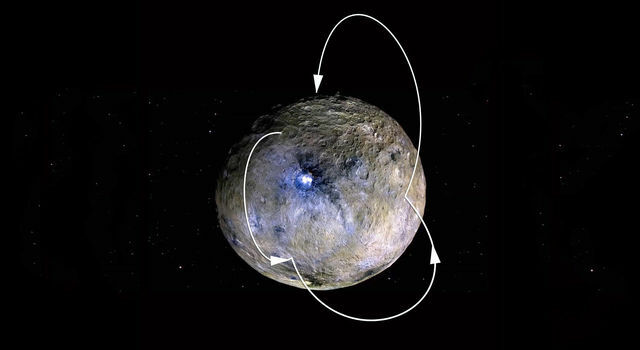 Their distribution throughout the dwarf planet's crust indicates Ceres' surface material has been altered by a global process involving water. Although Ceres' phyllosilicates are uniform in their composition, there are marked differences in how abundant these materials are on the surface. For example, phyllosilicates are especially prevalent in the region around the smooth, "pancake"-like crater Kerwan (174 miles, 280 kilometers in diameter), and less so at Yalode Crater (162 miles, 260 kilometers in diameter), which has areas of both smooth and rugged terrain around it. Since Kerwan and Yalode are similar in size, this may mean that the composition of the material into which they impacted may be different. Craters Dantu and Haulani both formed recently in geologic time, but also seem to differ in composition. "In comparing craters such as Dantu and Haulani, we find that their different material mixtures could extend beneath the surface for miles, or even tens of miles in the case of the larger Dantu," Ammannito said. Now in its extended mission, the Dawn spacecraft has delivered a wealth of images and other data from its current perch at 240 miles (385 kilometers) above Ceres' surface, which is closer to the dwarf planet than the International Space Station is to Earth. The spacecraft will be increasing its altitude at Ceres on Sept. 2, as scientists consider questions that can be examined from higher up. Occator Crater, home of Ceres' intriguing brightest areas, is prominently featured in this image from NASA's Dawn spacecraft. 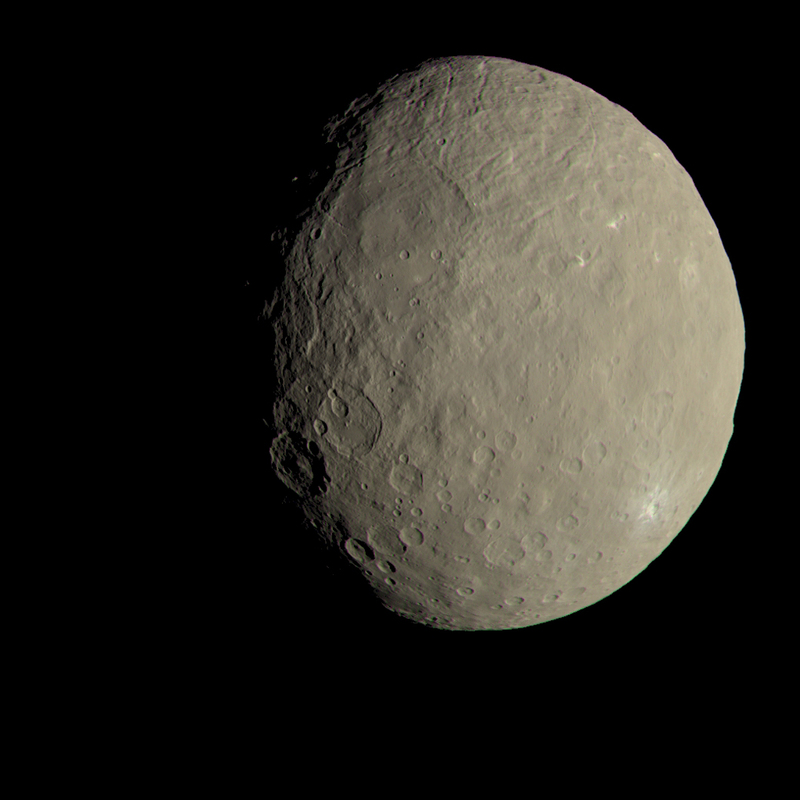 This image of Ceres approximates how the dwarf planet's colors would appear to the eye. This view of Ceres, produced by the German Aerospace Center in Berlin, combines images taken during Dawn's first science orbit in 2015 using the framing camera's red, green and blue spectral filters. The color was calculated using a reflectance spectrum, which is based on the way that Ceres reflects different wavelengths of light and the solar wavelengths that illuminate Ceres. On Nov. 4, Dawn began making its way to a sixth science orbit, which will be over 4,500 miles (7,200 kilometers) from Ceres. While Dawn needed to make several changes in its direction while spiraling between most previous orbits at Ceres, engineers have figured out a way for the spacecraft to arrive at this next orbit while the ion engine thrusts in the same direction that Dawn is already going. This uses less hydrazine and xenon fuel than Dawn's normal spiral maneuvers. Dawn should reach this next orbit in early December. One goal of Dawn's sixth science orbit is to refine previously collected measurements. The spacecraft’s gamma ray and neutron spectrometer, which has been investigating the composition of Ceres' surface, will characterize the radiation from cosmic rays unrelated to Ceres. This will allow scientists to subtract "noise" from measurements of Ceres, making the information more precise. Ceres' uppermost surface is rich in hydrogen, with higher concentrations at mid-to-high latitudes -- consistent with broad expanses of water ice, according to a new study in the journal Science. Concentrations of iron, hydrogen, potassium and carbon provide further evidence that the top layer of material covering Ceres was altered by liquid water in Ceres' interior. Scientists theorize that the decay of radioactive elements within Ceres produced heat that drove this alteration process, separating Ceres into a rocky interior and icy outer shell. Separation of ice and rock would lead to differences in the chemical composition of Ceres' surface and interior. Der Krater Occator auf dem Zwergplaneten Ceres ist ein Hingucker: Mit einem Durchmesser von 92 Kilometern ist er größer als der Krater Tycho auf dem Mond - der selbst von der Erde aus mit dem bloßen Auge als heller Fleck zu erkennen ist. Seine Wände ragen mit bis zu 2000 Metern höher empor als die Eiger-Nordwand in den Berner Alpen. Und seine hellen Flecken im Inneren des Kraters lassen weltweit die Wissenschaftler über ihre Beschaffenheit und ihren Ursprung diskutieren. "Der Einschlag, der diesen Krater entstehen ließ, hat sehr wahrscheinlich eine Verbindung zum tieferen Untergrund geschaffen - und so konnte vermutlich ein Gemisch aus Eis, Schlamm und Salz durch Spalten in der Kruste nach oben steigen", sagt DLR-Planetenforscher Prof. Ralf Jaumann, Mitglied im Kamera-Team der amerikanischen Dawn-Mission. Das helle kalkhaltige Salz an Ceres‘ Oberfläche ist der Rückstand dieses Prozesses. "Es hat also eine Art vulkanischer Tätigkeit stattgefunden - allerdings nicht mit geschmolzenem Gestein, sondern mit einem geschmolzenem Eis-Schlamm-Gemisch." Ein vom DLR-Institut für Planetenforschung erstelltes Video simuliert einen Überflug über den einzigartigen Krater. Vorgestellt werden die detaillierten Ergebnisse sowie weitere Bilder auf einer Pressekonferenz am 15. Dezember 2016 auf der AGU (American Geophysical Union). Grundlage für das Video sind 548 Bilder der deutschen Kamera, mehr als 10.000 Stereokombinationen sowie 106 Millionen berechnete Punkte auf der Oberfläche, aus denen die DLR-Planetenforscher ein dreidimensionales Höhenmodell des Zwergplaneten erstellten. Bei einer Auflösung von 32 Metern pro Pixel und einer Aufnahmehöhe von nur 370 Kilometern entsteht so ein Überflug, der dem Betrachter eine ideale Sicht auf die ungewöhnliche Topographie von Occator und den hellen Ablagerungen in seinem Inneren ermöglicht. Die hell reflektierenden Regionen haben mittlerweile auch Eigennamen erhalten: Die besonders auffällige Region mit hellen Flecken und einer rissigen Aufwölbung im Zentrum von Occator wurde "Cerealia Facula" genannt, die etwas weniger stark reflektierenden Flecken östlich davon "Vinalia Faculae". Auffällig ist, dass nicht alle großen Krater auf dem Zwergplaneten Ceres diese hellen Salzablagerungen zeigen, die in Occator bereits bei der Annäherung der Raumsonde Dawn an den Zwergplaneten Ceres gut erkennbar waren. "Der Einschlag könnte daher an dieser Stelle im Untergrund Material erwischt haben, das bei anderen großen Kratern vermutlich nicht vorhanden ist", vermutet DLR-Planetenforscher Prof. Ralf Jaumann. An der Oberfläche ist dann das aufgeschmolzene Eis unverzüglich in den gasförmigen Zustand übergegangen - während Schlamm und Salze auf der Oberfläche blieben. Dabei ist dies ein Ereignis, dass vor etwa 18 Millionen Jahren, für Geologen also in der jüngsten Vergangenheit, stattgefunden hat. Eine andere Theorie geht allerdings davon aus, dass Krustenmaterial durch die beim Einschlag entwickelte Wärme aufgeschmolzen wurde und es dadurch zu einer hydrothermalen Veränderung des Materials und zur Entstehung der Salze gekommen ist. Zurzeit befindet sich die Mission, bei der mit Asteroid Vesta und Zwergplanet Ceres zum ersten Mal zwei Himmelskörper aus einem Orbit beobachtet und erforscht werden, in der Verlängerung: Die ursprünglich geplante Mission hätte am 30. Juni 2016 enden sollen. Doch nun soll Dawn den größten Himmelskörper im Asteroidengürtel zwischen Mars und Jupiter möglichst noch bis zum Sommer 2019 erkunden. "Der Treibstoff für die Ausrichtung der Sonde könnte knapp werden, aber wir hoffen, dass wir miterleben können, wie der Zwergplanet auf seiner Umlaufbahn den sonnennächsten Punkt erreicht und vielleicht Aktivität zeigt", erläutert Ralf Jaumann vom DLR-Institut für Planetenforschung. Interessant sind diese Verlängerung sowie die dabei vorgesehenen Umlaufbahnen um Ceres auch für das Kamera-Team, in dem auch DLR-Planetenforscher beteiligt sind. Bisher konnten nahezu alle 2,8 Millionen Quadratkilometer Oberfläche von Ceres mit der deutschen Kamera an Bord erfasst werden. Das entspricht der Fläche von Frankreich, Deutschland, Italien, Norwegen, Spanien, Schweden und Großbritannien. "Allerdings fehlen noch kleine Bereiche an den Polen von Ceres, auf die wir nun in der Verlängerung der Mission aus größerer Höhe besser blicken können." Derzeit umfliegt Dawn den Zwergplaneten in einer elliptischen Bahn und untersucht ihn aus einer Entfernung von 7500 bis 9350 Kilometern. Seit über neun Jahren ist Dawn bereits im Weltall unterwegs: Am 27. September 2009 startete die Mission, von Juli 2011 bis April 2012 erkundete sie den Asteroiden Vesta, bevor sie zweieinhalb Jahre lang zum Zwergplaneten Ceres reiste und dort im März 2015 in den ersten Beobachtungsorbit einschwenkte. "Für ein Fazit ist es allerdings noch zu früh - wir sind noch mittendrin", sagt Planetenforscher Ralf Jaumann. "Wir haben immer noch nicht die Entstehung von Ceres verstanden." Bisher sei vor allem eines sicher: "Auf Ceres sind sehr komplizierte Prozesse abgelaufen, die über Kollisionen und die dabei entstehenden Einschlagskrater weit hinausgehen." Der Himmelskörper sei in der Vergangenheit geologisch aktiv gewesen - und sei das mit Krustenveränderungen, Ausgasungen und Kryovulkanismus möglicherweise auch heute noch. WASHINGTON, DC — A recently discovered solitary ice volcano on the dwarf planet Ceres may have some hidden older siblings, say scientists who have tested a likely way such mountains of icy rock – called cryovolcanoes – might disappear over millions of years. Ahuna Mons seen in a simulated perspective view. The elevation has been exaggerated by a factor of two. The view was made using enhanced-color images from NASA’s Dawn mission. Adding to the puzzle are the steep sides and well-defined features of Ahuna Mons – usually signs of geologic youth, Sori said. That leads to two possibilities: Ahuna Mons is just as it appears, inexplicably alone after forming relatively recently on an otherwise inactive world. Or, the cryovolcano is not alone or unusual, and there is some process on Ceres that has destroyed its predecessors and left the young Ahuna Mons as the solitary cryovolcano on the dwarf planet, according to Sori. Ceres has no atmosphere, so the processes that wear down volcanoes on Earth – wind, rain and ice – aren’t possible on the dwarf planet. Sori and his colleagues hypothesized that another process, called viscous relaxation, could be at work. On Earth, viscous relaxation is what makes glaciers flow, Sori explained. The process doesn’t affect volcanoes on Earth because they are made of rock, but Ceres’s volcanoes contain ice – making viscous relaxation possible. On Ceres, viscous relaxation could be causing older cryovolcanoes to flatten out over millions of years so they are hard to discern. Ceres’s location close to the sun could make the process more pronounced, Sori said. 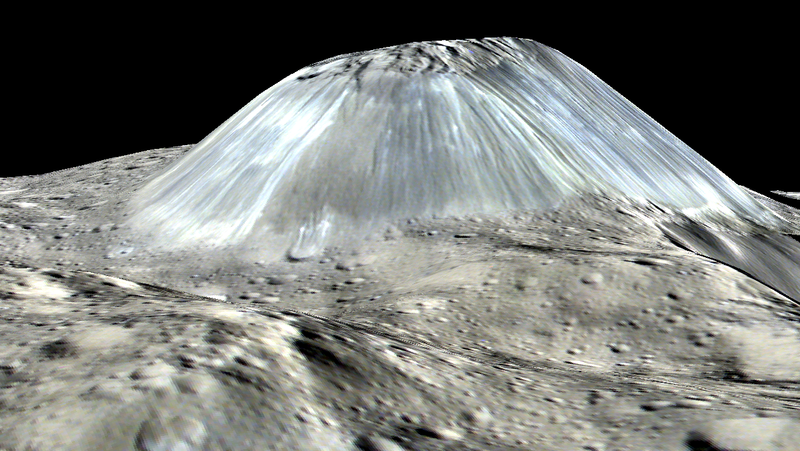 To test the idea that viscous relaxation had caused cryovolcanoes to flatten out on Ceres, Sori and his colleagues created a model using the actual dimensions of Ahuna Mons to predict how fast the mountain might be flowing. They ran the model assuming different water contents of the material that makes up the mountain – ranging from 100 percent water ice to 40 percent water ice, Sori explained. Ceres’ mysterious mountain Ahuna Mons is seen in this mosaic of images from NASA’s Dawn spacecraft. Dawn took these images from 385 kilometers (240 miles ) above the surface, in December 2015. The resolution of the image is 35 meters (120 feet) per pixel. The Dawn spacecraft has detected organic compounds on the dwarf planet Ceres. 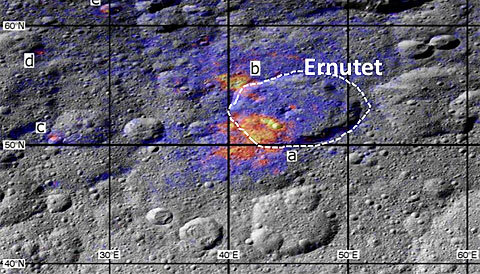 These Dawn spacecraft data show a region around the crater Ernutet on Ceres where scientists have discovered concentrations of organic material (labeled “a” through “d,” two more in this area not shown). The color coding shows the strength of the organics spectral absorption band, with warmer colors indicating the highest concentrations. Reporting in the February 17th Science, Maria Cristina De Sanctis (INAF Institute for Space Astrophysics and Planetology, Italy) and other members of NASA’s Dawn mission have found a big patch of organic compounds high in the northern hemisphere of the dwarf planet Ceres. Ceres is the largest member of the asteroid belt, and the Dawn spacecraft has been exploring it since 2015. Organics are not surprising in of themselves. Scientists have found them in meteorites (many of which come from asteroids), and we’ve also seen hints of them on the main-belt asteroids 24 Themis and 65 Cybele. But the signal Dawn picked up is much clearer than the ones from those other asteroids. The organics drape over the southwest floor and rim of the 50-km-wide crater Ernutet, with a few blobs nearby. However, the compounds don’t look to be connected to the crater itself; they're spread across about 1000 km2. Dawn also detected at least one more, much smaller deposit in Inamahari Crater, about 400 km from Ernutet. Unfortunately, the scientists couldn’t actually tell what the stuff is, just that it looks like aliphatic organic material. Aliphatic and aromatic are two types of compounds. Aromatic organics have molecular rings of carbon atoms and are fairly “processed,” chemically speaking; aliphatic compounds instead generally have straight chains of carbon atoms and have been less affected by heat and radiation. There are two reasons the result is interesting. One, Ceres also has tons of water ice, plus carbonates and salts. The addition of organic material makes the dwarf planet a promising environment for prebiotic chemistry. Two, the organics don’t seem to have been delivered by impacts — no clear cause-and-effect with particular craters, plus a hit probably would have distributed the stuff in diluted form along with other debris. Not to mention there’s other, clearly native material mixed in. Instead, the organics likely come from Ceres itself. Perhaps they’ve been brought up from below by some process, although how remains an open question. Scientists also recently suggested the little world might have a history of ice volcanoes, so maybe it’s more active than we suspected. Ceres' Occator crater, pictured here, has a bright material in its central pit, which also forms a dome. Researchers have found that the material is younger than the surrounding area and might have been pushed out from below. (Some of the bright material is in shadow from jagged mountains on the pit's edge.) This image was taken from 918 miles (1,478 km) above Ceres' surface. On the dwarf planet Ceres, volcanoes rage — but instead of hot lava coming out of them as on Earth, they spew brine and ice. 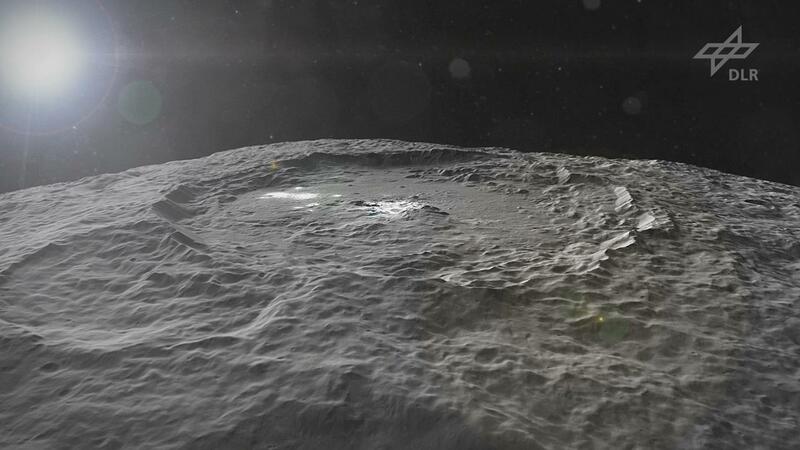 The new evidence for the dwarf planet's icy volcanism, called cryovolcanism, came from NASA's Dawn space probe, which orbits Ceres and also studied the nearby asteroid Vesta. Now, scientists at the Max Planck Institute for Solar System Research (MPS) have found evidence of such volcanic activity in action at the Occator impact crater, whose central pit has a bright, mineral salt material coating it that forms an upraised dome. The scientists found that the salty stuff in the crater is younger than the crater itself: It's only about 4 million years old, against the crater's 30-million-year age. That means the mineral salts welled up from below the surface, just as magma does on Earth. Such cryovolcanism has also been seen on Pluto and Saturn's moon Enceladus. At a distance of 257.4 million miles (444 million kilometers) from the sun, Ceres is the closest object that researchers have spotted that activity on. Dawn has been following Ceres for two years. MPS scientists have found evidence of complicated activity on the dwarf planet's surface: fractures, avalanches and younger, smaller craters. "In these data, the origin and evolution of the crater as it presents itself today can be read more clearly than ever before," Andreas Nathues, lead author on the new work and the MPS team's framing camera lead investigator, said in a statement. A false-color mosaic shows the inside of the Occator crater, with the bright dome of salty material visible at left. The central dome is about 1.8 miles (2.9 km) across and rises 1,300 feet (400 m). Occator crater is in the northern hemisphere of Ceres and is 57 miles (92 km) in diameter. The crater hosts a 7-mile-wide pit in the center, and its rim rises to 2,460 feet (750 meters) from the surface. Within the pit is a bright dome about 1.8 miles (2.9 km) across, which is made of the younger, bright material the MPS scientists found. Data from infrared cameras shows that it contains salts called carbonates. One thing that makes researchers think the dome is cryovolcanic, rather than just something buried beneath the crater site, is that other, later impacts did not expose similar material. To estimate the age of the crater and the dome, the team counted craters in the area. Lots of cratering means a given patch of surface is older and has been exposed longer. The odds are that the impact that made Occator allowed the brine to come closer to the surface, eventually erupting out.